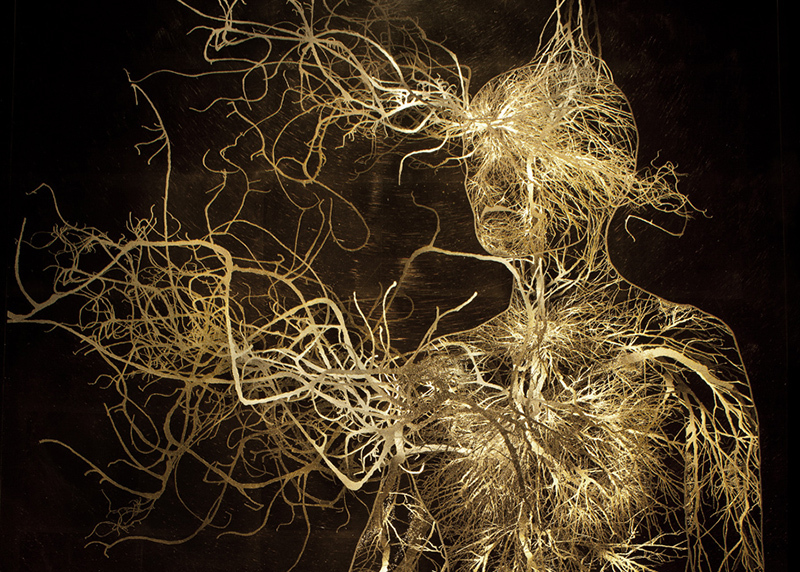 Greg Dunn spent years studying the human brain, only to spend countless additional hours trying to depict it in his art. Yet the neuroscientist-turned-artist says he is humbled by how much more complex the brain is than he could ever hope to show. But not for lack of trying. Working with physicist Brian Edwards, Dunn developed an artistic process he calls “microetching” to better capture the complexity of the human control center. Microetching begins with a two-dimensional image created by Dunn. The image is then scanned and encoded using Edwards’ algorithm. 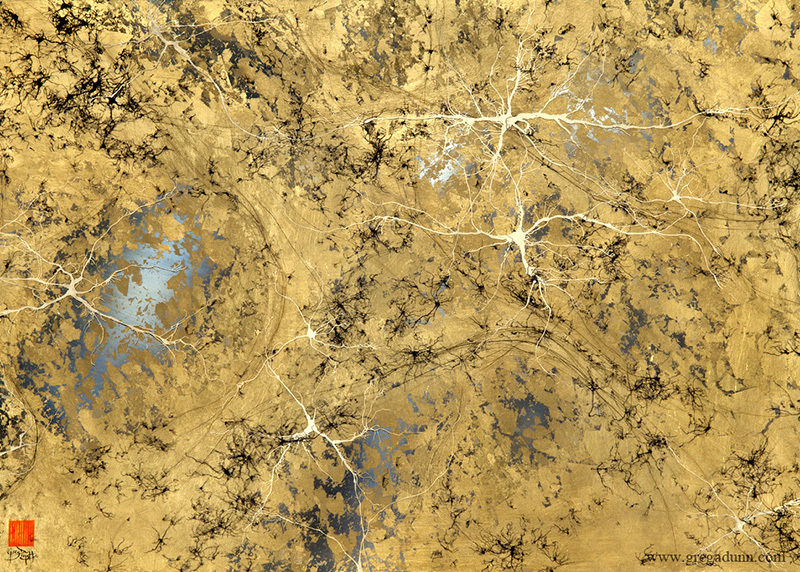 The result is a sheet of gold leaf, engraved on a microscopic scale. The process adds another dimension and depicts how the brain works through reflections of light. When his art is on display, Dunn uses different colored lights and angles to change the work’s appearance based on where the viewer is standing. 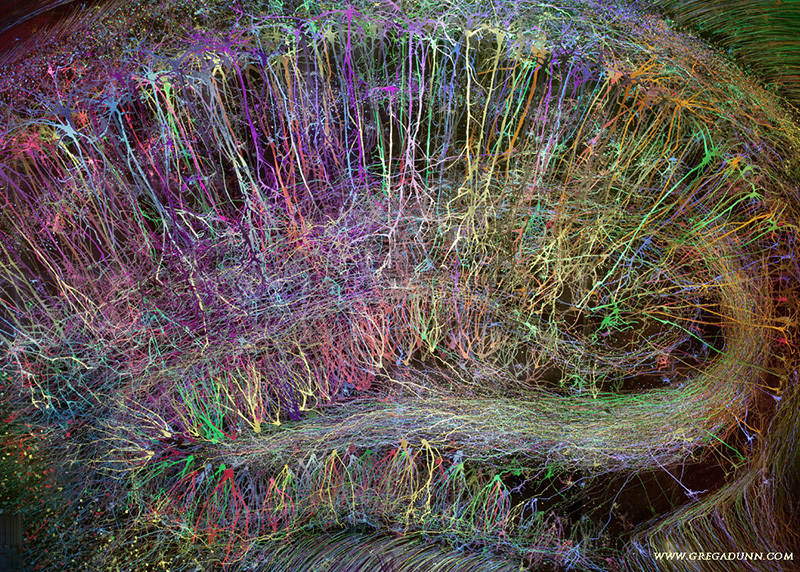 The resulting image depicts the movement of individual neurons. Neurons are cells that generate messages by reacting to external stimuli and their internal environment. 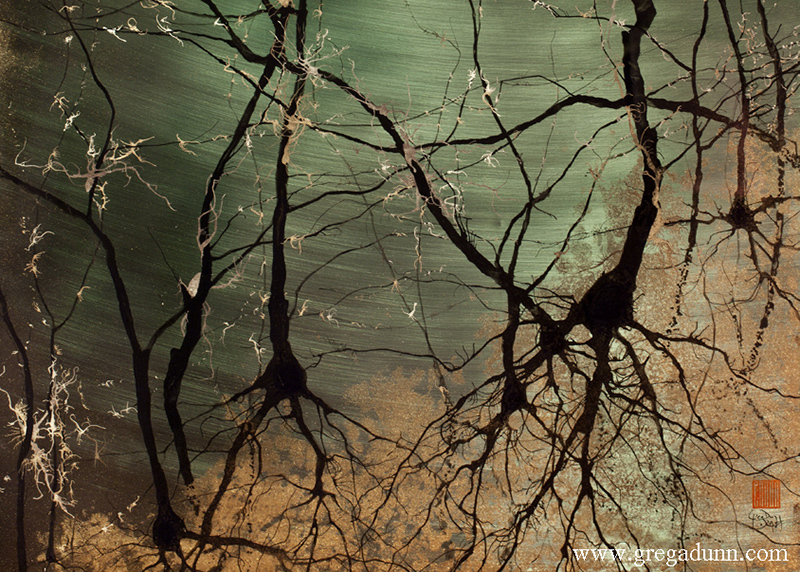 Several of Dunn’s pieces also depict glia, non-neural cells also found in the brain. 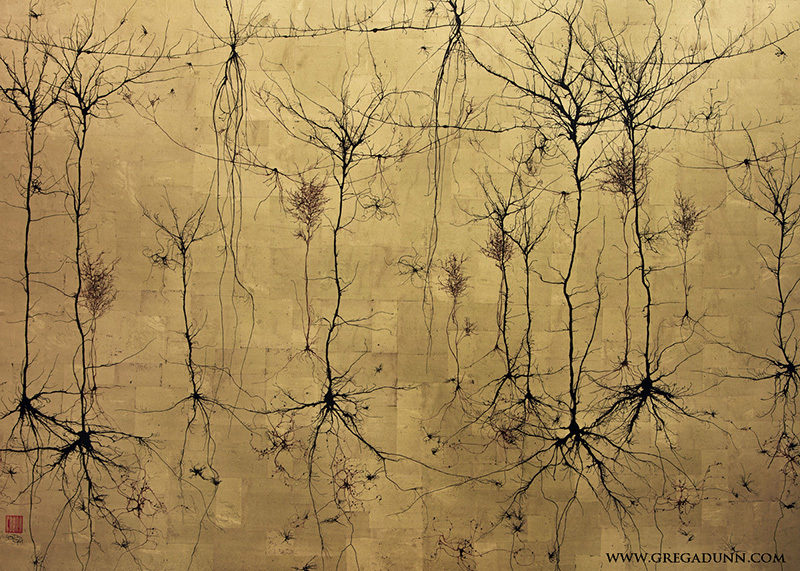 When it comes to his microetchings, Dunn hopes that people walk away with an appreciation of the beauty and complexity of our brains. Dunn also produces paintings on a scroll. 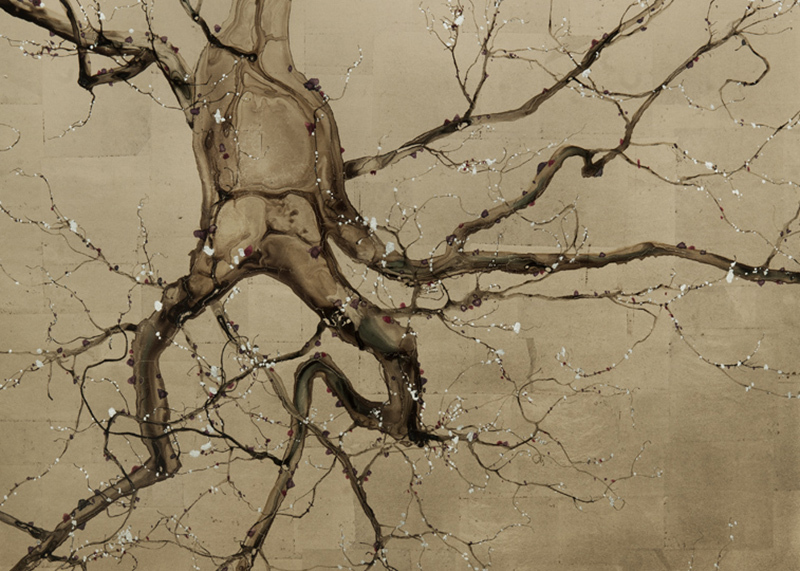 One of these, titled “Alzheimer’s Tangles” depicts the abnormal tangled structures formed from diseased neurons that make a defective protein. Dunn’s maternal grandfather passed away from dementia around 2010. Depicting the brain in his art began for Dunn while in graduate school. While using art as an outlet for the stress of graduate school, he drew upon the beauty of what he was studying every day: the brain. Dunn is wrapping up a showcase of his work “Mind Illuminated” in Philadelphia. His work is also on display in Boston and Baltimore. More information can be found on gregadunn.com. 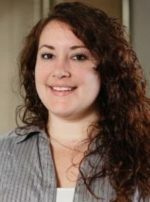 Shannon Simcox is a freelance contributor to Making Sense of Alzheimer’s. She received her Bachelor’s of Arts from Pennsylvania State University. Poet Christine McKee reads a selection from her first book, "On Shady Lane." One of the things that Bee Drachenberg and her mother, Eulene Moores, have shared is music. The graphic memoir’s lean drawings and honest language combine to paint a loving portrait of a family living through Alzheimer's. Bill Eisen has twice experienced once-in-a-lifetime loss: the death of one’s spouse to dementia. Making Sense Of Alzheimers Copyright © 2019. Made possible by a grant from MetLife Foundation, with support from the Neurodegenerative Disease Ethics and Policy Program at the University of Pennsylvania and the Outreach, Recruitment and Education Core of the National Institute on Aging-designated Alzheimer’s Disease Center at Penn, and donations from people like you.